When you are looking for an office furniture installer, Precision Office Furniture Installation has the experienced team you are looking for. No matter what type of company you have, you need to have your space organized so that your employees can work effectively. We can also handle your total facility management, coordination and equipment installation. At Precision Office Furniture Installation, we provide professional office furniture installation services using advanced technology to get the job done right the first time. 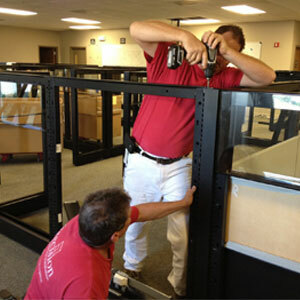 All aspects of your furniture installation are handled with the utmost precision. We help you plan and organize new installations or reconfigure your current office space to provide you with the quality environment you want. Our service team has what it takes to help organize your existing space and furniture in such a way that it will meet your new expectations. No matter what kind of furniture installation services you need, Precision Office Furniture Installation has what it takes to get the job done. From our project managers to our office furniture installers, each member of our team is experienced, professional and courteous.